Hey there, welcome to my blog. This is odd because I've never been a person of too many words, nor have I have I felt like I had anything worth posting up on the web for all the world to see. I do however spend a lot of time thinking about music and drumming and feel that like-minded individuals might find enjoyment in some of the dialogue I hope to present here. Since deciding to have a website focused on the art of drumming, it was always my hope to share some of the interesting things I've been exposed to, the bulk being transcriptions I've done over the years---> hence NEAT BEATS. Since college, I've steadily added more and more graphite to a weathered manuscript notebook to the point that it's now full and beginning fall apart. So with some amount of effort to better-preserve the neat grooves, solos, and licks I've spent hours and hours, nights and years jotting down, I've been transferring those most underrepresented-yet-worth sharing into Sibelius. Over the coming months I hope to share my favorites of those rhythmic nuggets with you guy(s). The first such nugget (and a most fitting one for my first entry on NEAT BEATS) is a back-and-forth between Roy Haynes and sax virtuoso Rahsaan Roland Kirk. It's off a 1962 Impulse! date called Out of the Afternoon, on which Roy was the leader. The track is a medium-tempo jazz waltz version of "Fly Me to the Moon" in which Roy and Rahsaan spend a couple of choruses trading 8-bar phrases, then 4-bar phrases, and finally 2-bar phrases. What I find awesome about this conversation is that Roy displays a perfect balance of pyrotechnic "drummer flash" (fast paradiddle-based rolls, tasty stick-on-stick textural jabs, over-the-barline phrasing, splitting rudiments between the limbs, swinging soooo hard, etc...) all while also being super musical and interactive with what Rahsaan is doing ( at times, PLAYING TWO SAXES SIMULTANEOUSLY!). Dig these licks, and check out the rest of the album too because it's golden. 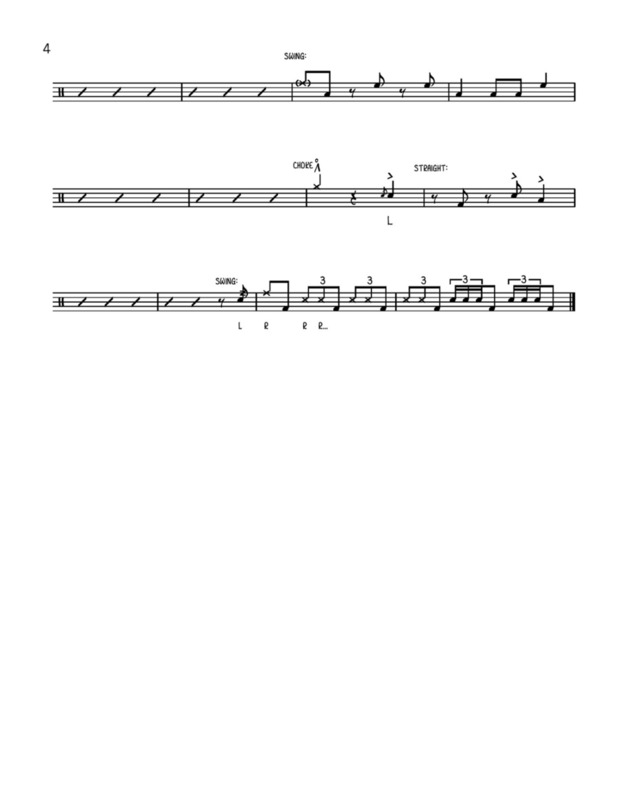 Please feel free to download the images of my transcription below if you like Roy's style and want to inject a bit of it into your drumming vocabulary. All "Xs" on the snare drum line indicate a right-on-left stick shot. Some essential stickings are written in, and you can choose your own adventure for the rest. Please enjoy!